Did you know we sell 2’x2’x6′ Concrete Barrier Blocks? A.k.a. 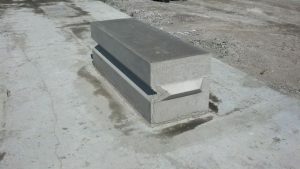 Jersey Precast barrier, these blocks are specially made with our forms for several purposes. Blocks can be used for making walls, for the actual weight, or for making a building of your own. They are used in purposes for agriculture, construction, landscaping and for tents. You can pick up the blocks or have them delivered. Call us today for more details!